inMotion Real Estate Media, wins the Web Marketing Association’s 2013 “Real Estate Standard of Excellence” award for recent web design showcasing Riverview Square, a commercial office property in Hartford, CT. 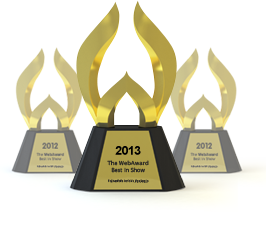 The WebAwards are dedicated to setting the standards of excellence and innovation in web design and development. It recognizes the individuals and agencies that are responsible for developing the best and most effective websites on the internet today within 96 industries. The “Real Estate Standard of Excellence” award winners are selected using criteria that includes overall design, ease of use, copywriting, interactivity, use of technology, innovation and content.